We’re down to the Final Four! A brief recap of what we’re working with: Representing the Clear Skin category is Aztec Indian Healing Clay Mask; the Hydrated Skin category has Weleda’s Skin Food; Smooth Skin is repped by Biologique Recherche's P50; and Ole Henriksen's Banana Bright Eye Crème is on the bracket for Glowy Skin. 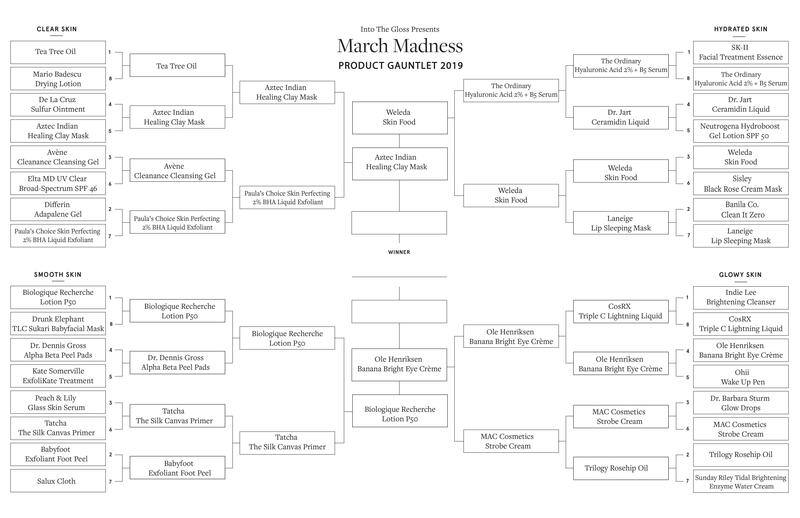 It’s been quite a season, and the next time you’ll see March Madness on ITG will be on Friday, when the winner will be revealed. Vote amongst the remaining four products below now, and then circle back Thursday morning for the final round of voting between the last two products standing. That’s enough of that administrative business for now. Let’s look back at how the season took shape. - In the battle between old school versus new school, the old-timers prevailed. Good old fashioned clay eliminated the sal-acid contender from Paula’s Choice. Which goes to say, the way we treat pimples may be evolving, but the method we trust the most is an old standby. - Affordable options are leading the charge. Save for the gutsy P50, the big bucks items were taken out of the competition early on. Sisley Black Rose Mask? Couldn’t make it past the first round. The same goes for Barbara Sturm’s Glow Drops, Drunk Elephant’s Baby Facial, and SK-II’s Treatment Essence. The lesson here is that if you’re going to cost a mint, you better pay big in results. So here’s where you come in again. Vote between the final four below before Wednesday, 11:59PM EST. And the last two products will be pitted against each other Thursday on Twitter. The winner will be announced Friday!